When Will Nonprofit Boards Learn to Plan for Succession? The CEO has resigned with two weeks notice. Whatever the scenario, the pace of the organization will likely slow. Some senior managers may vie for the position or, in self-interest begin to look for new positions, as insurance. Staff members begin to speculate about the future of their department and their positions. Several reasons, alone or in tandem, can explain the problem. •	Board members can see themselves as “birds of flight” over-viewing the nonprofit. They are not full-time employees and typically have a six-year connection with the agency. Involvement of board members continues to be a challenge for nonprofits, especially as more time-stressed millennials move into board positions. •	Succession planning can be a sensitive and difficult discussion topic for board members. Directors often have not had much interpersonal staff contact, and may not be aware of individual staff member leadership skills. •	I have not seen many nonprofit board directors with a strategic interest in succession planning because CEO and staff turnover is often modest. Many may assume there must be a current employee who can quickly become an interim CEO. 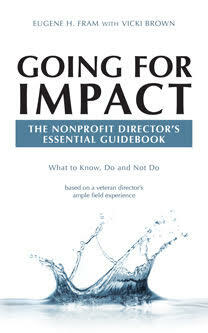 •	The nonprofit board has a responsibility for over-viewing the talent bank of the organization. Succession should be an annual discussion topic on the board’s agenda. To keep the focus, even when change is not imminent, the group needs to have some interpersonal contact with key people below the CEO level. This provides an opening to have more access to information, as suggested by Sarbanes-Oxley, and also allows the board to be in a position to made a rapid decision for an interim CEO. Viewing a person making an occasional management presentation just isn’t sufficient to make judgments about his/h leadership potential. •	At the least, when a new CEO is appointed, the board needs to determine who on staff has the necessary qualities to be an interim CEO. If there is no one, the board needs to qualify capable outsiders who can step-in. Pools for identifying this type of person include: consultants, former board members and managers, and temporary management placement organizations. •	Talent development and succession planning need to be developed as a director responsibility and a strategic leadership skill. This can take board time and energy. However, the organization can pay dearly at a transition period if neglected for years. •	Quarter 1: Convene a few key board members and your executive director and conduct a survey and analysis of your leadership landscape. •	Quarter 2: Plan two, two-hour conversations – one with the staff (or the management team in larger organizations) and one with just the board (or an a appropriate committee of the board)— about the results of your leadership landscape survey. …. Then take appropriate action steps. •	Quarter 3: If your assessment indicates it, have a conversation with your executive director and/or any board leader serving in a position for more than five years about their expected tenure and building the capacity of others to carry out their key duties. Make clear ahead of time that this is no a “you-need-to-leave” conservation. •	Quarter 4: Review your emergency succession plan and update it. *Todd Owen (2014) “Who needs succession planning? Your organization does.” Nonprofit Talent, March 11th. ← Does the Nonprofit CEO Need to Go? ?